As the name implies, the Studio Selfie targets those who love to take self portraits. The Selfie is sold unlocked, but is the first phone from Blu to be certified for use on T-Mobile's network (including band 12 LTE for expanded coverage with T-Mobile's “Extended Range LTE”.) 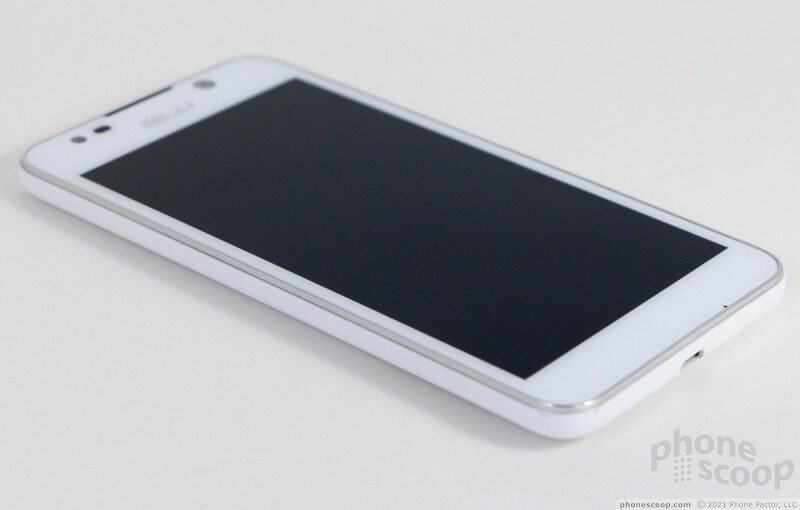 This inexpensive Android smartphone covers the basics and doesn't stray from its direct approach. If you're looking for a spare handset, or have decided it's time to give your pre-teen his or her first phone, the Blu Studio Selfie is a reasonable option. 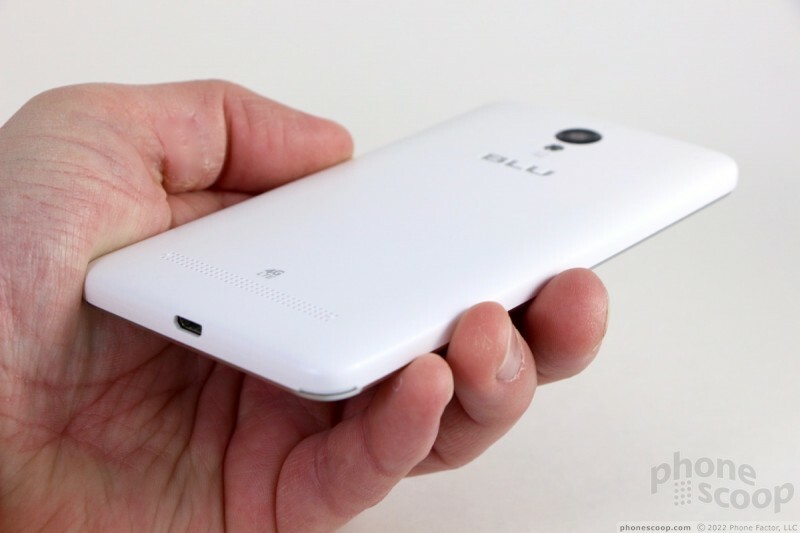 The Blu Studio Selfie's design and build are impressive for a $99 handset. Many phones that play in the sub-$100 space are cheap and flimsy feeling. The Selfie is legit. It may be a simple phone, but it gets simplicity right. The Selfie reminds me a bit of the first iPhone, if you combined it with a mid-range Lumia handset from Nokia. The shape is plain. 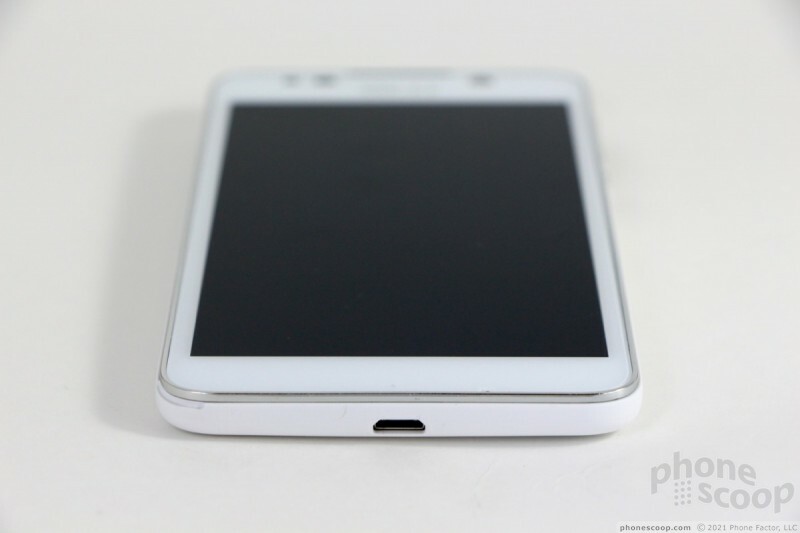 I like the rounded edges and metal accent that defines its face. Our review unit is white, but the Selfie comes in black and gold, too. The rear surface is perfectly flat, which means it's easy to use when placed on tables or other flat surfaces. The single piece polycarbonate shell wraps gently around to form the sides, eliminating seams that might otherwise catch your skin. The shell has a matte finish, which I appreciate. It contrasts well with the glossy front. The Selfie is what passes for normal these days when it comes to size. 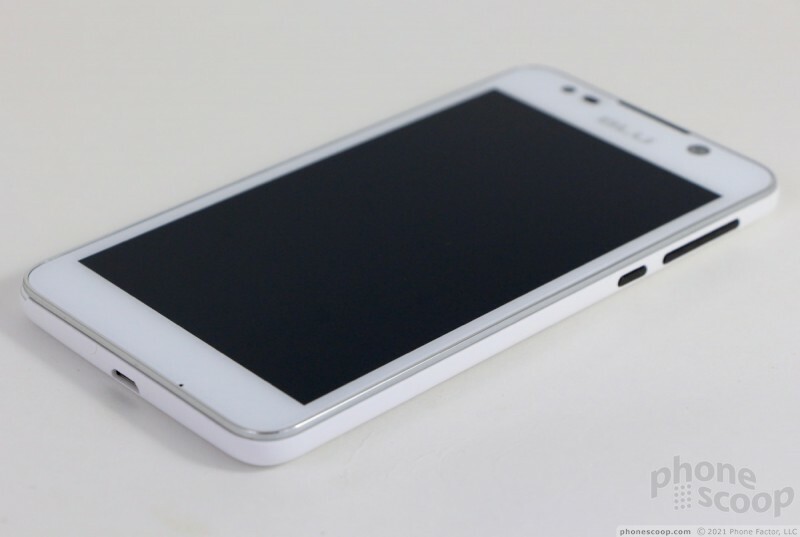 It has a 5-inch screen and rather thick bezels surrounding the display. It is slim and light enough to be comfortable to hold and use. I had no trouble reaching the phone's controls, though I suppose people who have small hands may find it a wee bit too big. I'm surprised by the strength and rigidity of the Selfie. The phone is assembled tightly and feels quite solid. You'd never guess its price by touching it. Blu rimmed the Selfie in chrome. 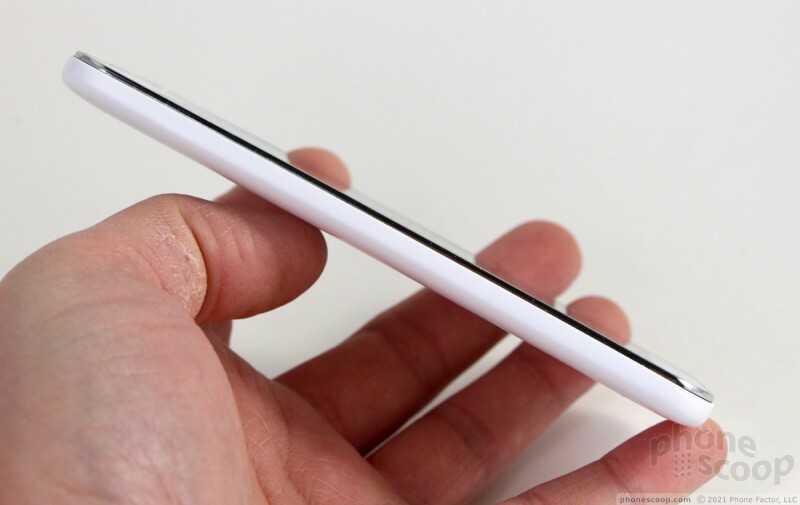 The rim is just a bit higher than the glass itself, which will help protect the glass when the phone is placed face down. 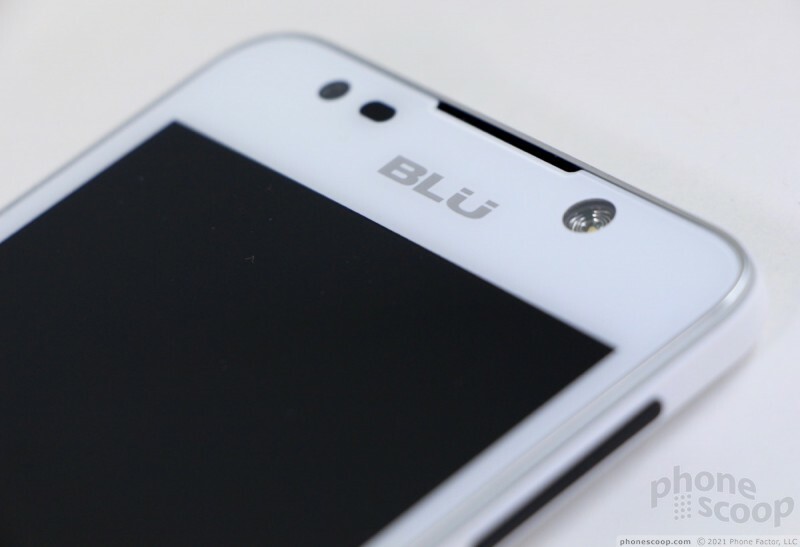 Blu's logo is emblazoned in chrome above the screen, where it's nestled between the user-facing camera and huge front flash. The black volume toggle and screen lock buttons — located on the right edge — stand out visually by contrasting with the white shell. Physically, the buttons are a bit flat for my tastes, but the action is good. The headset jack is on top, the microUSB port is on the bottom. There are no controls on the left side of the phone. Small holes drilled across the rear surface hide the speakerphone. 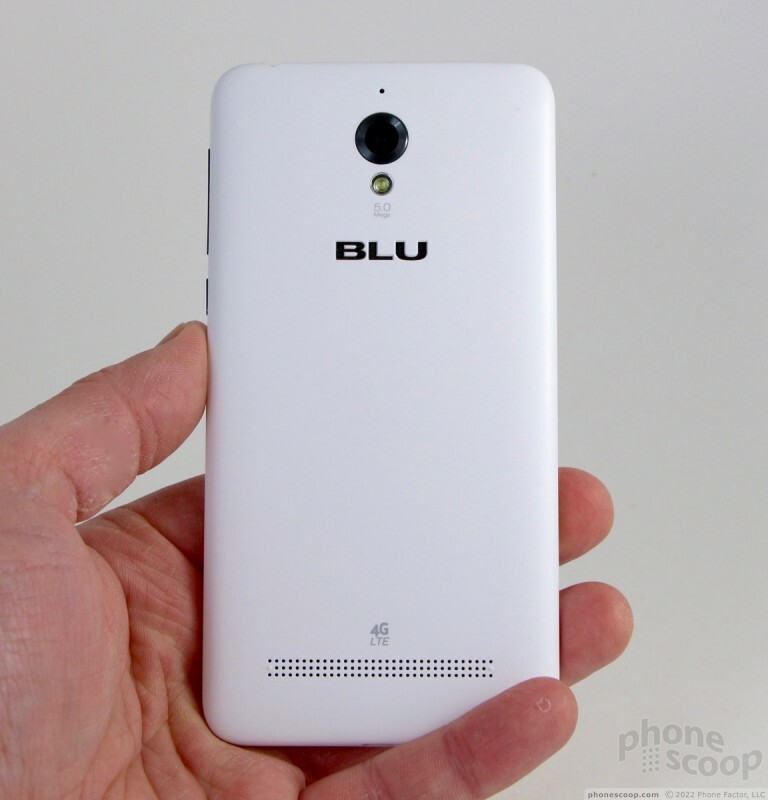 Blu's logo is set in raised type and I often felt it with my finger when I had my hand in my pocket. The flash, camera, and (another) microphone hole are stacked atop one another where most cameras are positioned. 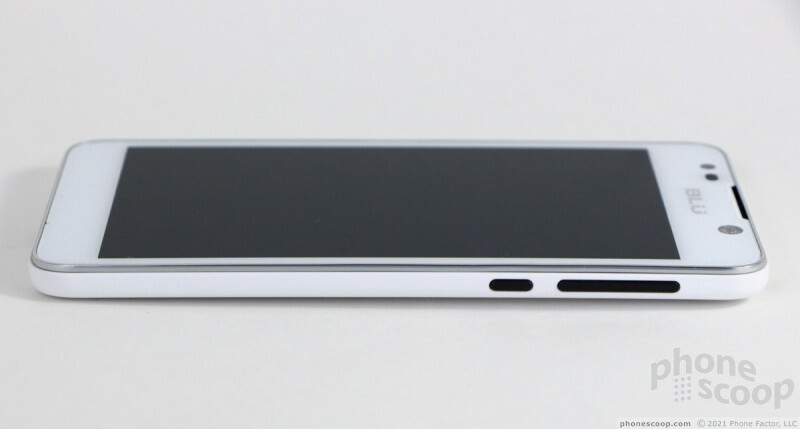 It's quite easy to remove the rear shell thanks to a thumb notch in the lower corner. The battery is removeable, and in fact must be pulled in order to insert either a SIM card or microSD memory card. I appreciate that the Selfie includes a memory card slot, but I'd rather not have to yank the battery to swap cards. 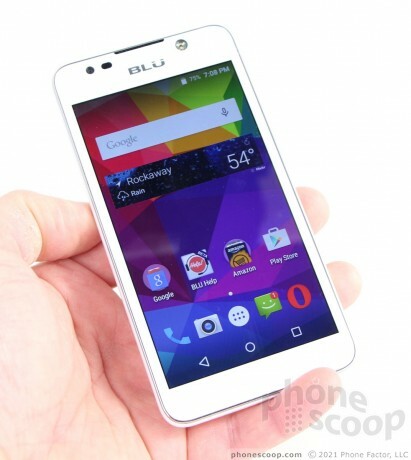 In all, the Blu Studio Selfie is perfectly good inexpensive piece of hardware. 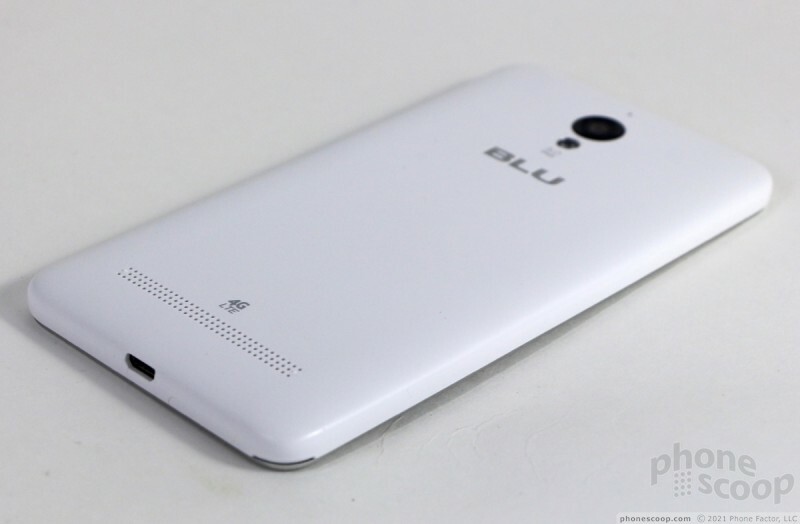 Blu couldn't reach the $99 price point without making some hard choices. 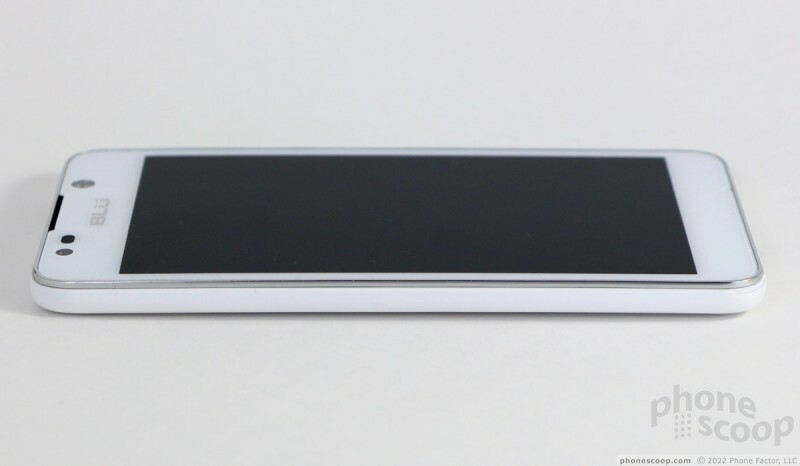 The 5-inch LCD panel has just 854 by 480 pixels. Screens are one of the costliest components of any smartphone, and the Selfie's is no doubt inexpensive. My eyes are completely and utterly spoiled by full HD and quad HD screens. I can see pixels all over the place on the Selfie's screen, viewing angles are rather poor, and the lack of oleophobic coating means the glass is quickly marred by fingerprints and other grime. Still, it's not a terrible screen and it certainly suffices given the price of the phone. I was able use it outdoors with no problem. This is important: the Selfie has been approved to run on T-Mobile's network in the U.S., complete with support for Band 12 LTE. (Not many unlocked phones have band 12, and those that do are often barred from using T-Mobile's band 12 network.) That means the Selfie offers the full LTE experience available from T-Mobile. 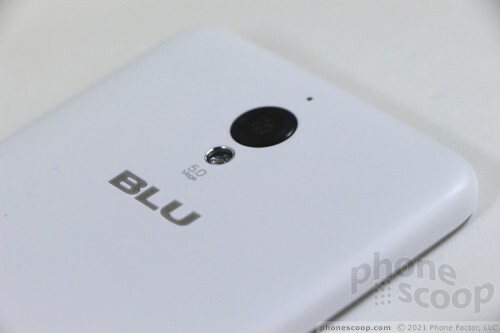 Like all Blu handsets, the Selfie is sold unlocked. It also supports AT&T's LTE network, including band 17. I tested the phone on both AT&T and T-Mobile's networks in and around New York City and found it to perform on par with other phones from AT&T and T-Mobile. 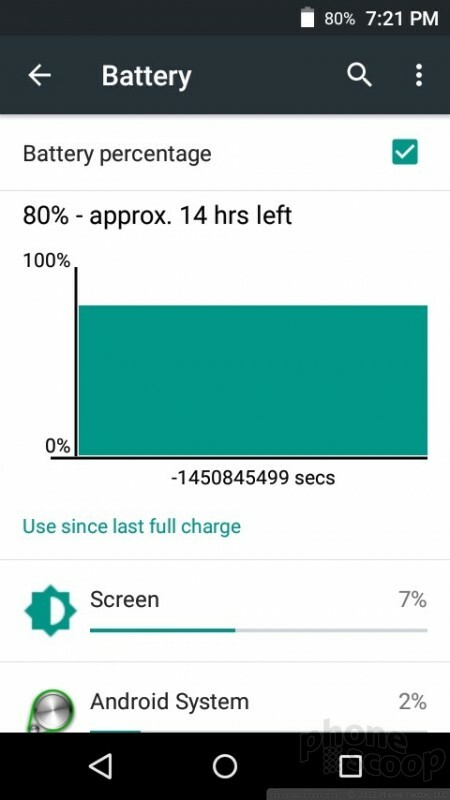 The phone maintained a network connection at all times and never dropped or missed calls. It was able to hold a call at highway speeds, and the Selfie delivered solid data performance when browsing the web. The Selfie's radio does its job. Call quality is mediocre. The earpiece produces just barely enough volume for use in regular spaces, like at home or the office. Loud spaces will easily drown it out. Voices sound mostly clear, but I didn't care for the timbre overmuch, which left me a little cold. Those I called through the Selfie said I didn't sound all that great. The speakerphone is pathetic. It feebly burps out scratchy sound that is hard to hear in quiet spaces. I couldn't hold a conversation in my car at all through the speakerphone. Ringers and notifications always managed to get my attention and the vibrate alert is adequate. If you're thinking the 2,000 mAh battery seems a bit small, I'm right there with you. The saving grace here is the display. With fewer pixels to worry about and keep lit, the Selfie doesn't require as much power as a phone with an HD screen might. On average, the Selfie still had about 25% power left at the end of the day when used lightly. More intense use meant the battery was down to single digits by bedtime. It just barely gets the job done. The Selfie includes the system-level battery saver tool from Google. 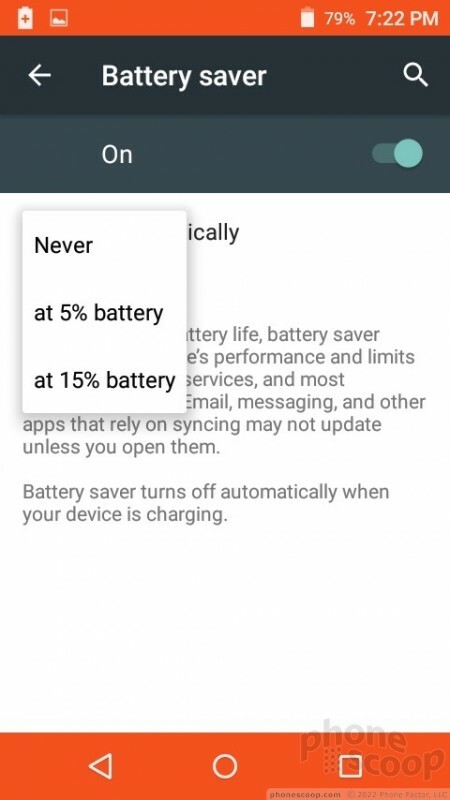 You can turn it on manually, or set it to kick on automatically when the battery reaches 15% or 5%. It helps a little bit. The Selfie pairs easily with other Bluetooth devices. I was able to connect it to my PC, car, headsets, speakers, and other phones. Calls sent to a mono headset were atrocious, but music pushed to a wireless speaker sounded pretty good. The Selfie doesn't have NFC, but the WiFi performed admirably. The GPS radio talked to Google Maps well enough. I thought the Selfie was a bit slow to locate me (over 10 seconds), but accuracy was good at about 20 feet. Google Maps wasn't very snappy, possibly due to the phone's slower processor. Still, it worked for navigation. 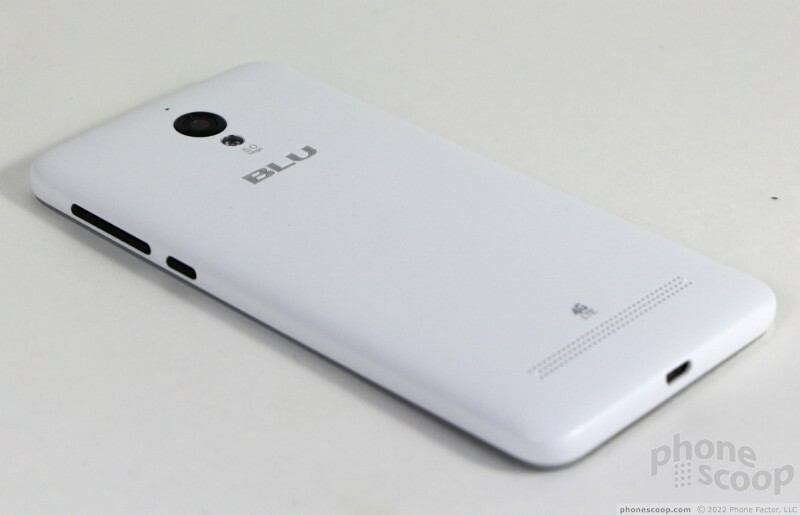 Blu is a fast-growing name in the U.S. phone market.